After 18 months of coaching and a day full of evaluations, Patrick Briggs, AVID State Director for Texas, didn’t make Claggett Creek Middle School wait any longer. “I congratulate you for being named an AVID Demonstration School,” he said on Wednesday, March 15 to applause from CCMS faculty and staff. Claggett Creek is just the third AVID Demo middle school in Oregon, following Parkrose in Portland and Stephens in Salem, which received the distinction just the day before. 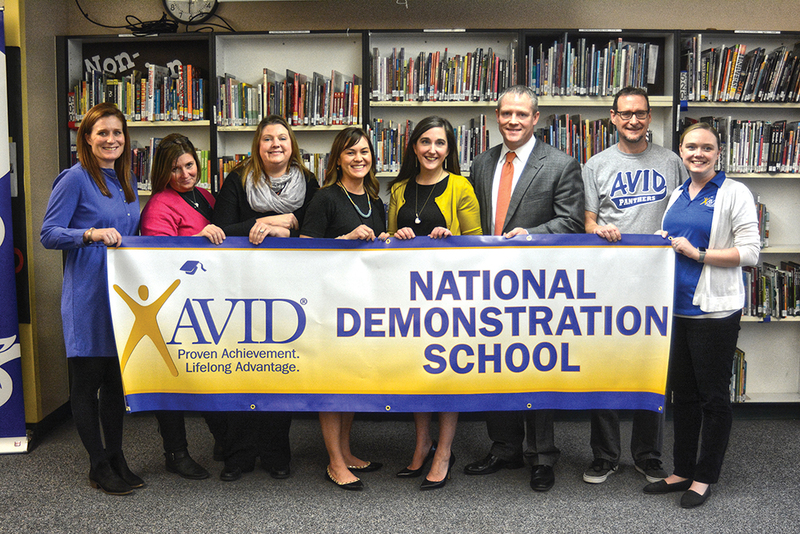 AVID validates schools for one-, two- and three-year terms. CCMS received three and will be re-evaluated in 2020-21. “The longest I can leave you with is three and I feel very comfortable doing that based on everything I saw,” said Briggs, who visited AVID classrooms and tutorials in all three grade levels. Briggs complimented Claggett Creek’s culture. Briggs said that wasn’t the case at all of the schools he visits. Briggs was also impressed with Claggett’s systems and shared leadership. “That is so refreshing to hear,” he said. Briggs gave CCMS recommendations—continue high expectations; close the gap between AVID and non AVID students; refine Cornell notes, planners, journals and interactive notebooks; and improve gender and racial equity (AVID classes are currently about 60 percent female). Principal Rob Schoepper congratulated Claggett Creek staff on the accomplishment. CCMS began AVID in 2009 with one eighth grade elective class. It expanded to seventh grade the following school year and then into sixth grade in 2011-12. After three years of declining reading scores, Claggett looked at its AVID classes and saw better GPAs and attendance and decided in 2013-14 to take AVID strategies school-wide and built a plan to double the amount of kids in the AVID electives. Coordinated by Kelly Greer, CCMS has seven elective teachers Jon Shrout (language arts), Brad Dixon (social studies), Trista Lewis (Spanish), Donna Wyatt (health), Ben Dalgas (English language development), Stephanie Rabago (math) and Jenna Becker (math) for seven classes that reach 22 percent of students. As a demo school, CCMS becomes a learning lab where schools all over the country can visit to see AVID at work. A showcase is scheduled for the fall. “We believe that it’s going to be a real celebration point, especially for the Claggett community, our parents and the community have been behind this school for a lot of years and to be national demo school is going to be a real feather in everybody’s cap,” Schoepper said. 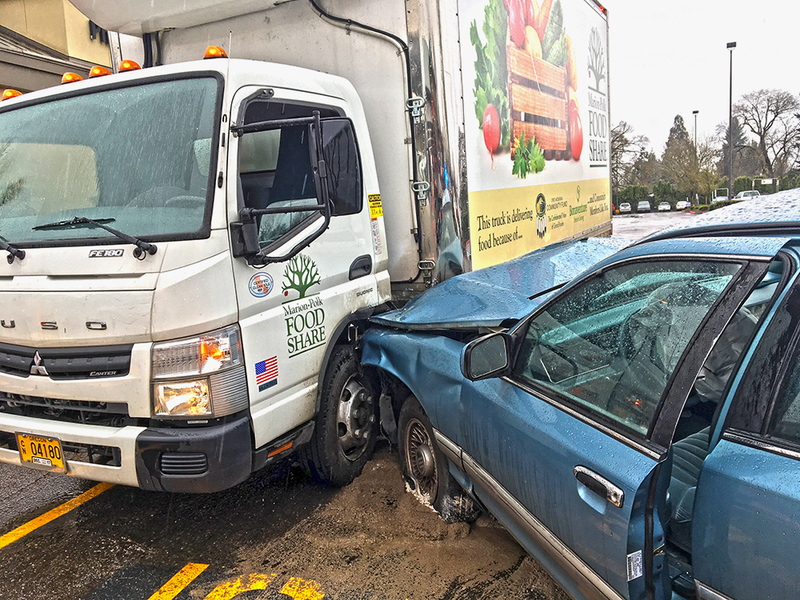 An unlicensed 14-year-old girl driving a friend’s vehicle crashed into a Marion-Polk Food Share truck in the Safeway parking lot Monday, March 13. Deputy Chief Jeff Kuhns was returning to the police station about 12:40 p.m. when he observed a 1994 Mercury traveling east on Lockhaven Drive North and turning south on River Road North too quickly. The vehicle’s speed caused it to drift into oncoming lanes of traffic. Kuhns began following the vehicle with three occupants inside and the driver had trouble maintaining a single lane, nearly crashing into another driver when changing lanes. By the time the Mercury turned left onto Chemawa Road Northeast, Kuhns had radioed ahead to the station and requested a patrol officer make a traffic stop on the Mercury. Still trailing the Mercury, Kuhns stopped on Chemawa Road Northeast to allow an approaching patrol car to make a U-turn and make the traffic stop. At that point, the Mercury sped up and attempted to turn into the Safeway parking lot where it collided with the MPFS truck waiting to make a left turn. Kuhns said the driver was again going too fast to make the turn safely. The crash caused the airbags to deploy. During an investigation, a 17-year-old passenger told officers she had gone to McNary High School to obtain the paperwork to re-enroll at the school and allowed the 14-year-old to drive the car after leaving the campus. The third passenger was 15 years old. The 17-year-old was injured when the airbags deployed. She was cited for providing a vehicle to an unqualified driver. The 14-year-old was arrested and taken to the Marion County Juvenile Detention Facility and charged with reckless driving and failure to perform the duties of a driver. The driver of the Marion-Polk Food Share truck was unharmed. A Keizer man was arrested after leading a Keizer police officer on a high-speed chase about 2 a.m. on Friday, March 17. A Keizer police officer spotted a 1999 Chevrolet Silverado pick-up fly past the 7-Eleven parking lot at an estimated 70 miles per hour in a posted 35 mile per hour zone. The officer attempted to catch up with the driver and activated his overhead lights. The driver of the Chevrolet made a high-speed turn on Dearborn Avenue Northeast and rode up over the curb nearly striking a traffic signal pole. The officer continued the pursuit and activated his siren. The Chevrolet continued traveling in excess of the speed limit on Dearborn before making another turn on Paulette Street Northeast and coming to a stop. The pursuing officer was joined by two additional patrol units and the driver was taken into custody without further incident. Michael Zepeda, 25, was arrested and taken to Marion County Correctional Facility where he was charged with reckless driving and attempting to elude an officer.